If one incident defined how much more Dublin were up for this game that Mayo it was when early in the second half, Aidan O’Shea got in behind the Dublin defence. He stumbled but fed the ball to Mark Ronaldson, who pulled the trigger. But out of nowhere Denis Bastick got back to not only block the ball, but gather it and break clear. It was an outstanding feat of athleticism and brilliance by the Ballymun Kickhams man. From as early as the fifth minute Dublin were in control and they never took their foot off the gas until the final minutes. Their running game had Mayo all at sea for the entire contest as they had runners popping up all over the field and Stephen Cluxton’s kick-outs picked out his man time-after-time as Mayo never got to the pitch of the contest for the entire 70 minutes. Even when they had the ball Mayo misplaced passes and ran down sky blue alleyways and turned the ball over to the metropolitans. Dubilin went in leading by 2-10 to 0-6 at the break, and it could have been even more had Bernard Brogan converted his first goal chance midway through the half. Denis Bastick hit the back of the net for the first goal six minutes in while Brogan finding the net 15 minutes later and killing off the game as a contest before the half time whistle had even arrived. The 13,545 who paid into MacHale Park got an exhibition of football; from Dublin. Mayo will have to go away and lick their wounds over the next two weeks before they make the long trip to Cork in the penultimate game in the league. Things started well for Mayo with Jason Doherty bisecting the posts inside the first 15 seconds and three minutes later Kevin McLoughlin free looked to have them moving in the right direction but that was as good as it got for Mayo as Dublin were about to move two gears ahead of them. Tomás Brady kicked their first score five minutes in and a minute later Bastick grabbed his goal. The ball was pumped in long and Tom Cunniffe got lost under it with Bernard Brogan sniping in behind, he shot for goal, but it hit the cross bar, coming back into play off Robert Hennelly’s back and into the past of Bastick who finished to the net from close range. The visitors followed up the goal with three more on the bounce, through Brady, Kilkenny and Jack McCaffrey. Doherty hit back with a free for Mayo 10 minutes in to cut the gap to five, but Jim Gavins men went rift back up the field and Dean Rock kicked his first of six points from frees over the 70 minutes. Five minutes later Rock kicked his second point, with McLoughlin responding with Mayo’s fourth. Just after the 21 minute mark Dublin sealed the two points when Borgan found the back of the net. 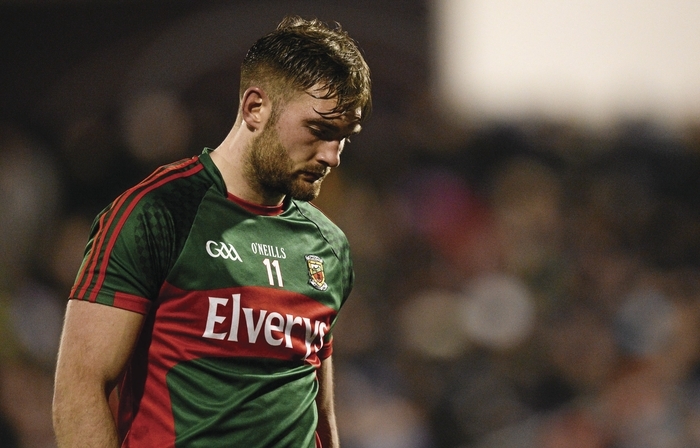 Kevin McManamon got away with hopping the ball twice in a row in the build up, but Mayo’s protests fell on deaf ears. From that moment on it was game over and all about Mayo trying to reel in the Dubs lead. They did manage two more points before the turn around through Doherty and Ronaldson, but Dublin were able to kick three more of their own to leave ten points between the sides. The second half saw Mayo create a few goal chances, but they couldn’t find the net to give some hope to the hardy souls who braved the cold March night. Dublin kicked the first three points of the second period with McCaffrey, Paul Flynn and Rock finding the target. Mayo kept plugging away, but they could’t prize the opening they needed, with Danny Kirby coming the closest to taking giving the home side something to cheer about when he spotted Stephen Cluxton off his line after winning a break from a kick-out, but his speculative effort crept just over the bar. Dublin kept clipping the points over the bar with ease when they broke up the field with Robbie Hennelly pulling off one smart save to stop McCaffery scoring Dublin’s third goal. Mayo: J Doherty 0-4 (3f ), K McLoughlin 0-3 (1f ), M Ronaldson 0-1, A Dillon 0-1, D Kirby 0-1. Dublin: D Rock 0-6 (6f ), B Brogan 1-1, D Bastick 1-0, T Brady 0-3, C Kilkenny 0-2, J McCaffrey 0-2, D Connolly 0-1, J Cooper 0-1, P Flynn 0-1, P Ryan 0-1.